Isn't life great on a year's sabbatical? It was a year ago that the Cataja cast off for a long voyage. Loyal Multihulls World readers, Eurielle and Antoine let us in on the technical and financial inside track on what has been a special year. Create a notification for "Crusing"
"What if we left everything behind and set off in a catamaran? We could travel the world in our home with our kids. We'd have a different outlook at breakfast-time each morning if we wished, we'd meet loads of new people and we could just go wherever we felt like going...." These were the kinds of ideas that Antoine started to sow in my mind! You probably think that that sounds pretty tempting. However, it took a while to take the idea on board as I'm a fairly down-to-earth kind of person, and had lots of worries and questions which needed to be addressed... I managed to answer some of the questions at the many boat shows which we visited... By going through this process, we were able to start dreaming about one day setting out. 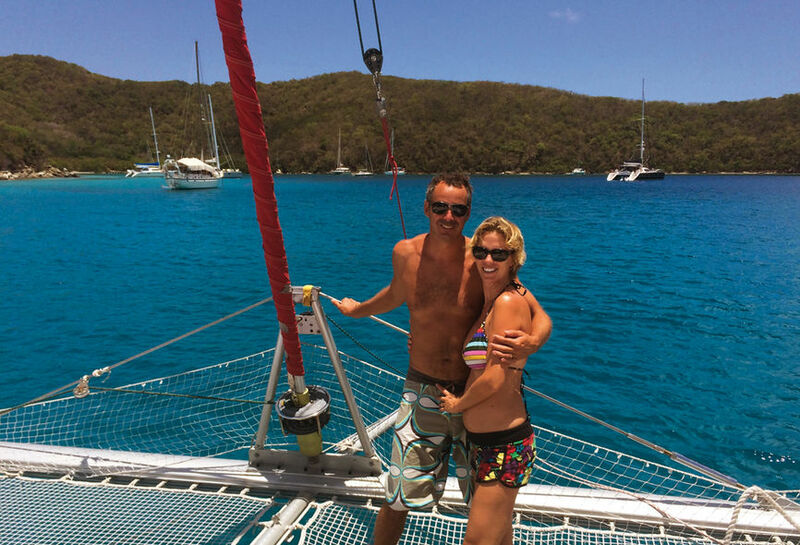 Eurielle and Antoine, happy with their new life on board a catamaran.